The Magic Bullet NutriBullet Pro 900 NB9-0901 is a powerful blender/mixer system that’s typically referred to as a “nutrient extractor” because it breaks down the whole of the fruits/vegetables including the skin to retain the full nutrient content including the fiber for a more nutritious smoothie drink. The NutriBullet Pro utilizes a powerful high-speed 900 watt motor (50% more powerful than the NutriBullet) together with patented extractor blades to break down and pulverize fruits, vegetables, frozen fruits, wheat grass, nuts, seeds and even ice in a matter of seconds! It’s simple to use – just add your favorite fruits/veg etc along with some liquid like water, milk or yogurt and let the machine work its magic! Because the NutriBullet Pro extracts the whole fruit/vegetable, there’s no messy pulp left behind like you would get with a traditional juicing machine, making clean up a breeze. The NutriBullet Pro 900 comes with 2 cups – one tall 32 oz cup and one shorter 24 oz cup, along with a regular lip ring, a handled lip ring, and a flip-top to-go lid so you can take your healthy drink with you on the go! Both cups can be used on the blender to blend directly into. To help get you started, the NutriBullet Pro 900 comes with a helpful User Guide with Recipe book and Pocket Nutritionist book. Useful tip: Extracted food is a great way of getting all the nutrients from foods in a “pre-digested state”, making it easier for your body to absorb and utilize the nutrients. N.B. It’s always advisable to consult your doctor or health care professional if you have any concerns regarding your health and/or nutrition intake. 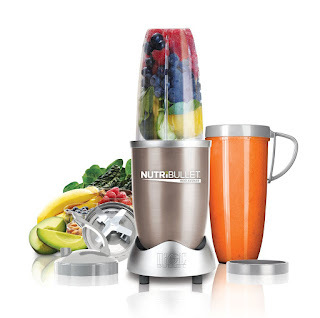 Comparing Vitamix 5300 versus Vitamix 5200 Blender, What's the Difference? Comparing Vitamix Pro 500 versus Vitamix Pro 300 Blender, What's the Difference? Comparing Vitamix 7500 versus Vitamix 750, What's the Difference?